From Tuesday night brawls at the legendary Blue Horizon, to throw downs at the Barclays Center, I have attended boxing matches at nearly every venue of note in the northeast. Yet for all of the live fights I have witnessed, I had never had the privilege of attending a fight at the Mecca of boxing, Madison Square Garden. That all changed on a whim Saturday night, when at the last minute I scored a pair of tickets to watch Bryant “by-by” Jennings challenge Wladimir Klitschko for all the marbles in the heavyweight division. As with any last minute ticket acquisition my choices were limited, and I found myself in the 200 section surrounded by Klitscko’s faithful, who were adorned in blue and yellow, the colors of the flag of Ukraine. Each time Wladimir’s chiseled features graced the big screen over the ring, the packed house would explode, with the loudest cheers emanating from the throng occupying the upper decks, of which I was now a part. Not that there weren’t a few chants of “USA” and an occasional “Philly in da house”, but the prevailing wisdom was that “by-by” was here add a sense of irony to his nickname, not to pull off the biggest upset since Hasim Rahman knocked out Lennox Lewis. Speaking of the former champ, he was in attendance sitting alongside the good boy himself, Gennady Gennadyevich Golovkin, who brought his fair share of cheers when featured on the big screen. Deontay Wilder was there too; hopefully doing some scouting for a highly anticipated unification match with the winner of the night’s contest. The lead in televised bout between rising star and local prospect Sadam Ali and. Francisco Santana was entertaining enough, but it was clear that the crowd was here to see the big men do battle. Apparently they had forgotten Wladimir’s last appearance at MSG, a brutal unification battle with then undefeated Sultan Ibragamov. Brutal with respect to what the fans had to endure that night, as Wladamir employed a dismal swatting technique against Ibragamov’s outstretched jab for 12 grueling rounds. Time, however, has healed all wounds, and NYC has welcomed Wladamir back with a packed house and open arms. Wladamir’s ring walk was accompanied as usual by the Red Hot Chili Peppers iconic “Can’t Stop”, which was a nice break from the generic hip hop being broadcast in the arena up to that point. His fans roared as he climbed into the ring and glared at his supposedly overmatched foe. This was not my first time at MSG; I have been here before for concerts and hockey. But the big room was made for boxing, and for this fan of the sweet science seeing the garden decked out for a championship fight was electrifying. I settled back into my seat in row 11 of section 221, and although the ring was actually closer than I thought it would be when I bought the tickets, it was pretty clear that I was going to be mostly watching the Jumbotron all night. No matter, tonight wasn’t about my distance from the ring, it was about the big fight experience on the biggest stage the boxing has to offer. Don’t get me wrong, I kept my expectations realistic. I wasn’t expecting a heavyweight classic; as long as I didn’t have to suffer thru a repeat of Klistchko vs Ibragamov I was going get my money’s worth. The fight started out as expected, with Wladamir using his jab against Jennings high guard and banking most of the early rounds. When he did uncork the right hand, it had good effect, but it also opened him up to Jennings return fire, so Klistchkos rights were few and far between. Jennings did most of his work to the body, wailing away with his free hand in the clinches. Occasionally Jennings would rush in and land an overhand right, which landed a few times and drew reaction from the crowd. 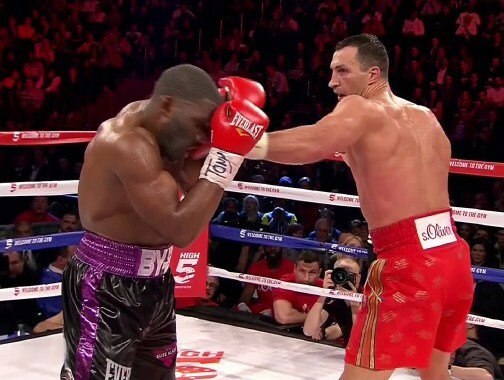 In the middle rounds Wladimir started tying up his shorter foe with greater frequency, much to the ire of referee Michael Griffin, who issued a few warnings before eventually taking a point in round 10. Most of the scoring blows in the fight were the result of Klitschko’s jab and sporadic right hands. Neither man appeared to be hurt in the fight until the 12th round when Klitschko was able to put a few combinations together which wobbled Jennings. Watching the fight I got the impression that if Wladimir was just a little less stingy with his right hand he could’ve hurt his challenger much earlier in the fight, and possibly gotten the knockout that many expected. In the end Wladimir seemed content to win a 12 round unanimous decision, with Jennings exceeding expectations in going the distance, and capturing 3 rounds on 2 cards and 2 on the third. Next up for Klitschko is reportedly a mandatory defense against England’s Tyson Fury, which has some intrigue based on Fury’s height and over the top personality. For Jennings, he should build on the momentum of this fight and challenge the man who was seated at ringside, Deontay Wilder. With some big fight experience on his ledger and 12 rounds against the best big man in the division, I have to believe that he would give Deontay Wilder a stern challenge. Wilder on the other hand would get an opportunity to best Klitschko’s performance if he was able to knock Jennings out. With Jennings being under the Gary Shaw banner, there shouldn’t be many roadblocks to making that fight. All said this fight played out like a heavyweight version of the first Mayweather vs Maidana fight, although the spirited challenger in both cases did more than what was expected of them, the truth is Jennings really didn’t come close to winning enough rounds to actually make this fight competitive on the cards. Max Kellerman asked Wladimir about a rematch in the post-fight interview, however, Jennings biggest asset in this fight was the element of surprise, and much like the unnecessary Mayweather vs Maidaina rematch, I have to believe that a rematch of this fight would play out even more one sided in the champions favor. In the end the Klitschko faithful were more than happy to take home a decision; it really didn’t matter to them that their hero hadn’t knocked out his worthy challenger. Unlike their bloodthirsty American counterparts (myself included), any path to victory by their champion is a cause for celebration. The euphoria from the victory spilled out onto the streets of Manhattan as fans left the arena. While this certainly wasn’t even close to Ali vs Frazier despite Wladimir’s reference to that iconic fight in his post-fight interview, it was a solid battle between two talented big men, both of whom came to win. It may ultimately be remembered as nothing more than an appetizer leading up to Mayweather vs Pacquiao on May 2, however it was, at least from the cheap seats, a battle worthy of the storied venue in which it was contested.